While Nyonya and the Peranakan are born and raised in Malaysia and Singapore, they mostly observe Chinese lunar calendar and celebrate numerous Chinese festivities. The year-round Chinese festivals call for festive foods—dishes that are significant to the festivals, for example: jiu hu char or fried jicama/yambean with shredded cuttlefish and loh bak. In my family, jiu hu char is an indispensable dish that is prepared for all festivals: Chinese New Year, cheng beng (qingming/清明), month of the hungry ghost, winter festival (tang chek or 冬至), and prayers to our ancestors. I remember vividly my childhood days when I had to help cut the vegetables for jiu hu char. Let me just say that it wasn’t fun as my family believes in the most traditional way of preparing Nyonya food, hence no graters or slicers were used. The special ingredient in jiu hu char is shredded cuttlefish or jiu hu see. From what I gather, shredded cuttlefish is mostly used by Nyonyas to make jiu hu char. My mother also used them for flavoring soups, which is awesome. Jiu hu char is wrapped with fresh lettuce leaves with tee cheo (sweet sauce) and chili sauce. They can also be eaten plain and go extremely well with rice. Jiu hu char is also one of those dishes that gets better overnight and after multiple reheating. In recent years, jiu hu char is gaining popularity and it’s one of the must-order items at Nyonya restaurants. Here is my family’s jiu hu char recipe, and this dish was prepared by my sister-in-law in Penang. Peel the skin of jicama/yambean and carrot. 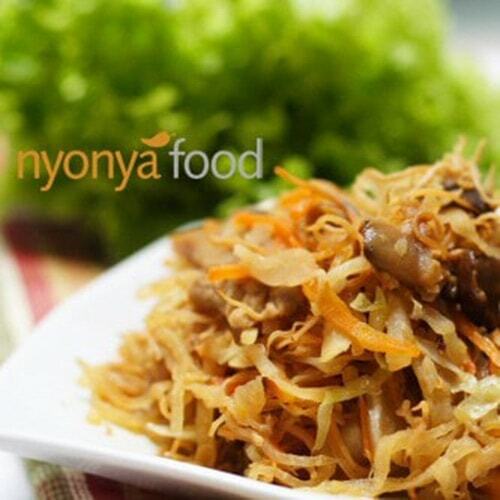 Slice and cut yambean, carrot, cabbage, mushrooms and onion finely into thin strips/threads. Boil the pork belly until it's cooked. Cut the meat into fine strips and set aside. Heat up wok, pour in cooking oil and add in garlic. Stir-fry the garlic until aromatic, add in the dried cuttlefish and continue to stir. Add in the vegetables and meat. Stir-fry until the vegetables are soft. Add salt, sugar and pepper to taste. Dish out and serve immediately with fresh lettuce leaves, tee cheo (sweet sauce) and chili sauce.